This story by Hilary Kenyon is excerpted from a publication called the Dredge, which is published by the Connecticut Sea Grant at the University of Connecticut. We found the selected article of interest as it discusses how they are selectively breeding oysters resistant to MSX. MSX is a parasite that has been a problem for growers on the East Coast for a couple decades.It was first noted in 1957 in The Chesapeake Bay and had a major spread in the 1980's. I like the article as it involves a collaboration between a commercial grower Norm Bloom and academia to foster the development of healthier stronger oyster strains. Having reserves of wild oysters who can grow and reproduce will enable that population to become more disease resistant over time through natural selection. In contrast oysters who are raised commercially and harvested before they are challenged by the disease and allowed to reproduce due not have the opportunity to strengthen the gene pool through natural selection. The protozoan parasite Haplosporidium nelsoni (MSX) is responsible for considerable oyster mortality in Connecticut. Following the devastating outbreak of 1997, there were no commercially significant sets on record and a period of low production followed. Such a profound gap in natural oyster sets struck a blow to the industry. In response, Connecticut Sea Grant has provided funding for a research project that aims to devise a technique for enhancing the State’s natural oyster beds which provide the seed that the vast majority of the industry depends upon. In the case of a disease epizootic, or during a time with little to no natural recruitment, this method would provide an economic cushioning for the oyster industry. Headed by Dr. Inke Sunila, Shellfish Pathologist from the Department of Agriculture/Bureau of Aquaculture (DA/BA), the research employs a biodegradable mussel netting or sock used to deploy remote-set hatchery reared oysters. The idea behind the project is that the socking provides a degree of protection from predators. diligent work ethic and lifetime of experience with shellfish, she has adopted the remote setting technique for a novel purpose – to boost the seed supply for Connecticut’s commercial industry. Conventional culturing practices involve hatchery raised oyster larvae settling on tiny shell fragments. This produces single (cultchless) oysters that require a nursery stage, elevated from the sea floor in either submerged cages or bags. Remote setting, however, circumvents this phase and allows oyster larvae to settle on full shells as they do in the wild. Just as natural set, settling on cultch enables hatchery-raised oysters to grow directly on the bottom. In simple terms, remote setting simulates Connecticut’s existing practices of collecting set from natural oyster beds and transplanting them to be grown on private leases. There is the added benefit of selective breeding—potential for increased oyster survival and growth. The “Clinton” strain of oysters has shown significant resilience and was chosen for the experiments. “Clinton” broodstock were obtained from Clinton, Connecticut following the MSX-outbreak of 1997 and have been selectively bred overnumerous generations. Using previously developed hatchery techniques, Karen Rivera and Kate Blacker of the Noank Aquaculture Cooperative conditioned and spawned the “Clinton” oysters. Larval oysters were then allowed to settle on cultch and grown in mesh cages at the hatchery prior to deployment. On a sunny afternoon in early June, I arrived at the Bureau of Aquaculture lab in Milford. As an undergraduate student researcher from the University of Connecticut serving as the coprincipal investigator for the project, I accompanied Inke to the Norm Bloom & Son oyster fishing dock in Norwalk. To prepare the shellfish grounds for the experiment, the first order of business was to remove existing shellfish,predators and other marine fauna from the lease.This is done by dredging. Captained by Jim Bloom, the dual-armed dredging boat repeatedly dragged along the sea floor and lifted the load onto the deck. An enormous pile of oysters, clams, snails, crabs, and other creatures quickly mounted as I scurried around the deck collecting and identifying specimens. When the pile towered over ten feet, the captain retired the dredge and headed back to the dock. The lease was then ready for the project and the researchers had a clear picture of what species they should expect to inhabit the area. A few weeks later, Tessa Getchis, aquaculture extension specialist from Connecticut Sea Grant, met Inke and me at the lab. It was the day we set aside to mark the experimental grid. Like all scientific research, however, a seemingly simple task proved to be more difficult in the field. In this case, the area was about two feet deeper at low tide than the charts show. Though not a problem for the oysters, it was a difficulty for two women in wetsuits. As our feet barely grazed the bottom, Tessa and I awkwardly moon bounced along as we measured and buoyed the transects within the lease. oyster seed. She proudly released the tailgate and carefully lifted a mesh bag from the truck bed. We immediately lit up as Kate placed the bag on the outdoor picnic table. Only a few millimeters in length, the oysters clung to the shells upon which they had settled. In order to track growth and survival rates, the researchers have begun a monthly sampling of the oysters that will continue into the next year. 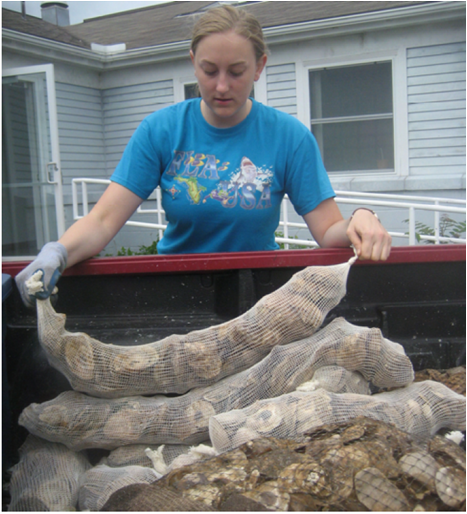 They predict that this approach of using biodegradable netting for oyster bottom culture has the potential to promote Connecticut oyster production in many ways. In addition to filling the gap between natural oyster sets, this form of remote-setting disease resistant oysters could potentially enhance currently unproductive natural beds and provide further economic prosperity. In terms of ecological significance, establishing successful beds will also promote improved water quality and overall improved biodiversity and health of Long Island Sound.